There are word order rules to consider when you use a combination of nouns and pronouns in a sentence. Wir schenken ihm eine Reise nach Wien. Ich schreibe dir eine Mail. - I write you an email. Wir schenken ihm eine Reise nach Wien. - We are treating him to a trip to Vienna. Sie geben sie ihnen. - They give them to them. (NB it could also mean ‘they give her to them’). Marienkäfer bringen euch Glück. - Ladybirds bring you luck (plural, informal). To wish someone luck, German speakers will say ich wünsche dir viel Glück or ich wünsche Ihnen viel Glück. They might give a chocolate or marzipan ladybird - einem Marienkäfer schenken - to accompany the wish, as ladybirds are thought to bring luck in Germany. The literal meaning of Marienkäfer is 'Mary's beetle'. Legend has it that the Virgin Mary sent the spotty insect as a gift to humans. Farmers in particular were fond of the little bugs as they would eat up any aphids that could ruin their harvest. As a result, many Germans consider it good luck when a ladybird lands on you. The expression toi, toi, toi is used to wish someone luck before an exam or before a performance. The phrase is thought to be an abbreviation of the word Teufel (devil) and was originally used to ward off evil. 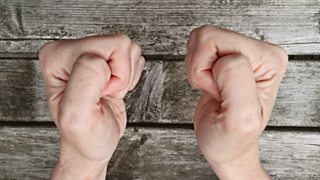 In the UK, people often cross their fingers to wish someone luck, but in the German-speaking countries, people press their thumbs into their fist. This practice is known as die Daumen drücken (literally: to press the thumbs). So, ich drücke dir die Daumen is another way of wishing someone luck.